In North America, this prostrate annual herb is reported from many states and provinces in the US and Canada, but is not reported from northern regions in Canada and from many states in the US southeast (USDA 2011). In BC, it reported from "dry, sandy or gravelly sites in the lowland and steppe vegetation zones; rare on S Vancouver Island and SC BC" (Douglas et al. 1999). 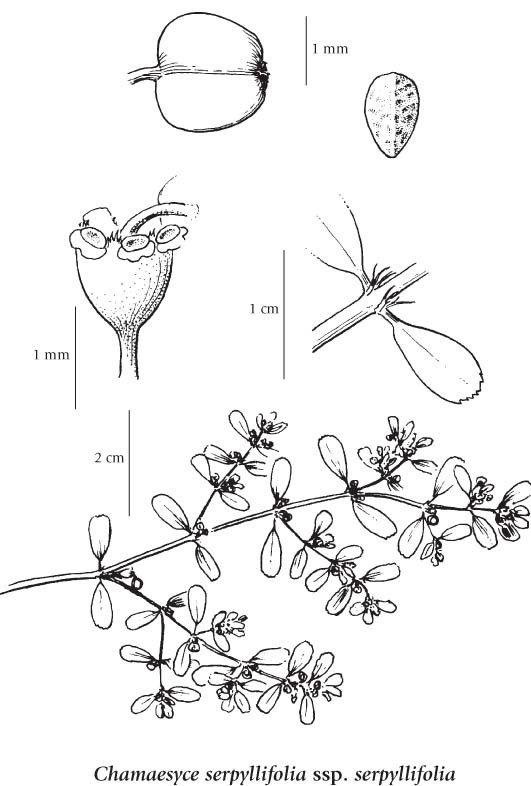 However, Lomer (2011), in his rare plants of the Fraser Valley article, describes it as follows: "A rare prostrate annual that grows along sandy receded pools, pond and lake margins in southwest and south-central BC; not dry sites as reported in most literature. Though the sites may by dry when the plants are mature, this species seems to require saturation during dormancy unlike the similar and common Chamaesyce glyptosperma (Engelm.) Small, which is a weedy species often found along roadsides. In BC C., C. serpyllifolia subsp. serpyllifolia is known from a few lakeshores on Vancouver Island, the Thompson River from Spence's Bridge to Kamloops, Shuswap Lake, and the Okanagan from Osoyoos north to Vaseux Lake. It was found for the first time in the Fraser Valley during the CDC survey in south Langley along a sandy receded lakeshore that was once a gravel pit (UBC: Lomer 6887). About 40 plants were growing with Corrigiola litoralis L., Anagallis minima (L.) Krause, Lindernia dubia (L.) Pennell var. anagallidea (Michx.) Cooperr., and Plagiobothrys scouleri (Hook. & Arn.) I.M. Johnst. In 2010 more than 100 plants were observed at the same site." Extracted from Botanical Electronic News #432, January 2011, with permission. Annual herb from a fibrous root; stems usually prostrate, freely branched with milky juice, 5-30 cm long. Obliquely oblong to more oblong egg-shaped, toothed near the tip, 5-15 mm long; stipules at the base lanceolate, irregularly margined, 0.5-1.5 mm long. 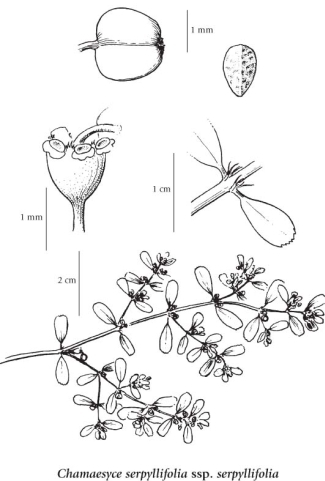 Inflorescence of small clusters of axillary involucres; involucres 1 mm long, bell-shaped; glands 4, with sunken centres, appendages whitish, lobed or small-toothed. Capsules, 1.5-2 mm long, glabrous; seeds 1.2 mm long, greyish-brown, sticky when wet, pitted to wrinkled or cross-corrugated. Dry, sandy or gravelly sites in the lowland and steppe vegetation zones; rare on S Vancouver Island and SC BC; E to MB and S to MO, TX, NM, CA and MX.